Primary schools workshop: Artwork by Rhona Byrne, photo credit, Ros Kavanagh. Our education and engagement activities for children and young people are designed to foster critical thinking and creative self-expression and to experience the arts as a valuable way of thinking about the world. Our activities are artist-led and focus on actively engaging with and responding to VISUAL’s exhibition programme to experience the meaning and relevance of contemporary arts practice in everyday life. 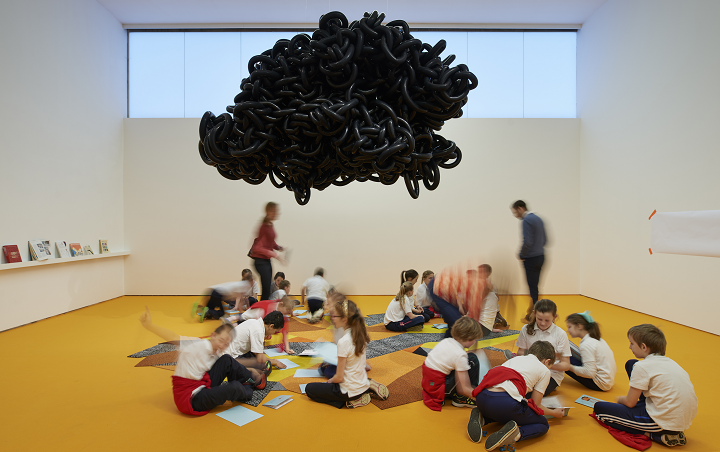 • Free drop-in make and play space in the galleries around season exhibition themes, with worksheets to assist children in independently exploring exhibition themes through creative play. • Primary school creative workshops developed around season exhibition themes. • Curriculum-based Schools programme of Junior and Senior Cycle intensive workshops in visual arts, plus curriculum-based theatre productions and film screenings with study aids. • Skills-based work placement programmes for TY and Further Education. • Annual partnership with Carlow Kilkenny ETB for artist-led students project in response to exhibition programme. • Dancehall Youth, teen dance group who engage with and respond to contemporary dance practice, in partnership with Dance Company United Fall. • Carlow Youth Theatre supported through provision of office, workshop and theatre space and reduced tickets to selected national touring drama. In addition to the annual programme, we also develop specific activities for children and young people in response to particular aspects of our exhibition programme. • Creativity and Engineering project for primary schools, in partnership with Engineers Ireland, as part of Spring exhibition themes of engineering and technology. • The Sandwich Project – food production and sustainability project for primary school children by artist Lisa Fingleton, as part of summer exhibition themes around sustenance. • Artist Residency - Claire Breen has developed an indepth relational engagement programme for primary schools to develop connection and participation with the socially-engaged practice of Marjetica Potrc and the exhibition theme of shelter.